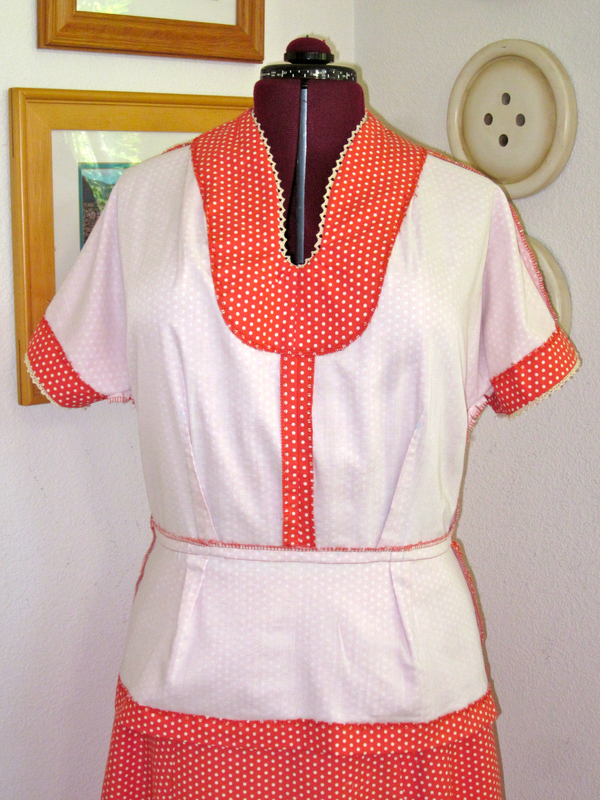 The Simplicity 4047 top is finally finished! It took FOREVER, and I am SO over it. But I am excited to wear it to work for Halloween on Monday. A couple of the guys (!) 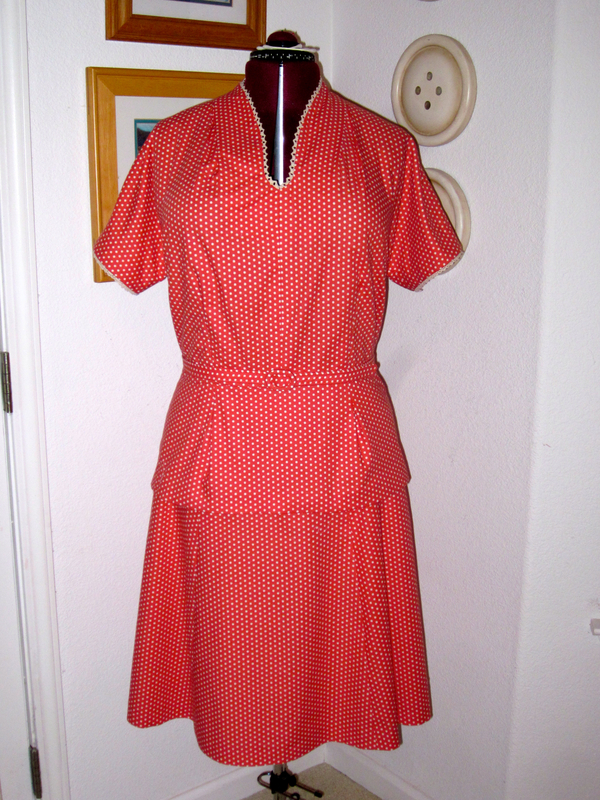 picked out Mad Men for our department costume theme, so I’m all ready. The outfit is all done, finally! Check out that snappy matching belt. 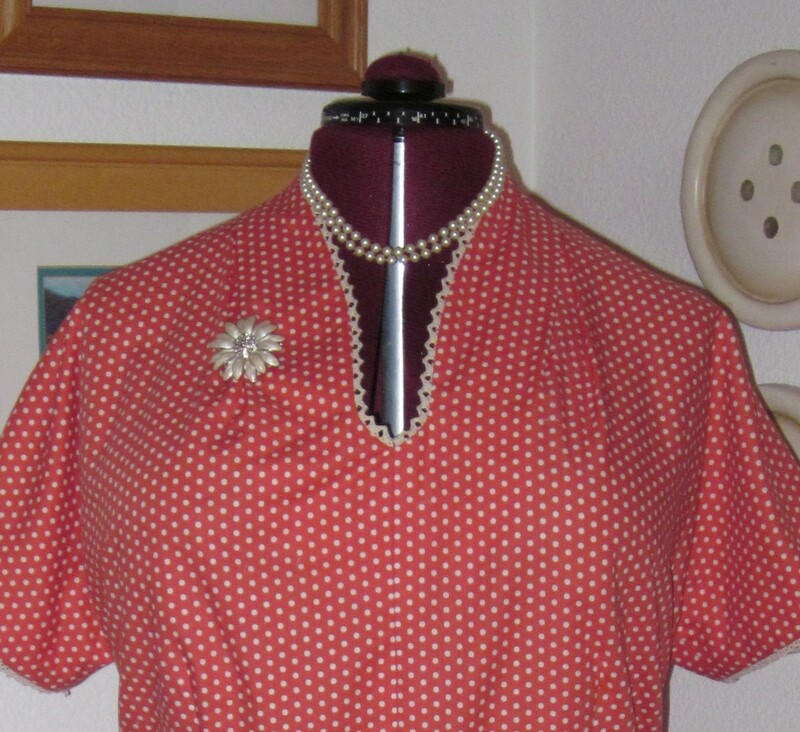 Can you tell the crochet lace at the sleeves is different from the lace on the neck? No? Perfect! The inside, from the front. How tidy does that look? The inside, from the back. No serger was involved. Yay! 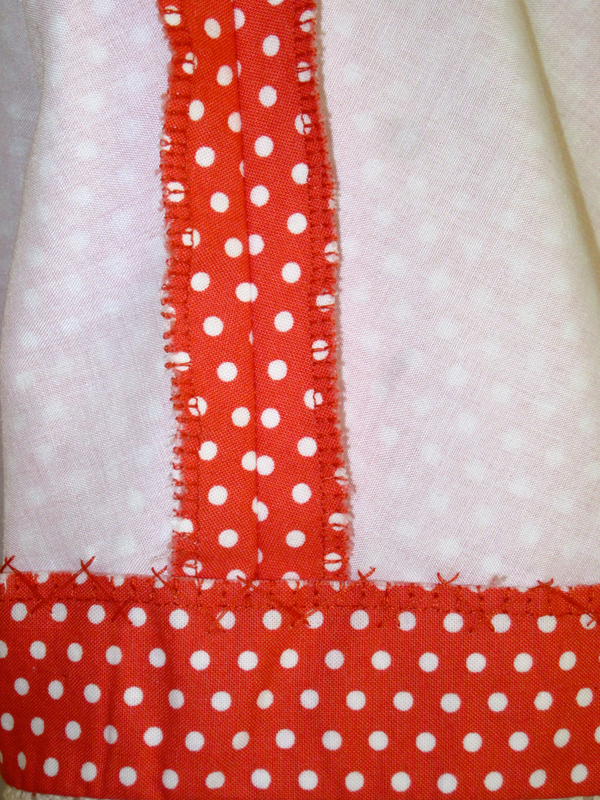 A close up of the hem. Check out that crazy catch-stitching. It’s the first time I’ve done that. I like it. You can never go wrong with pearls. Never. 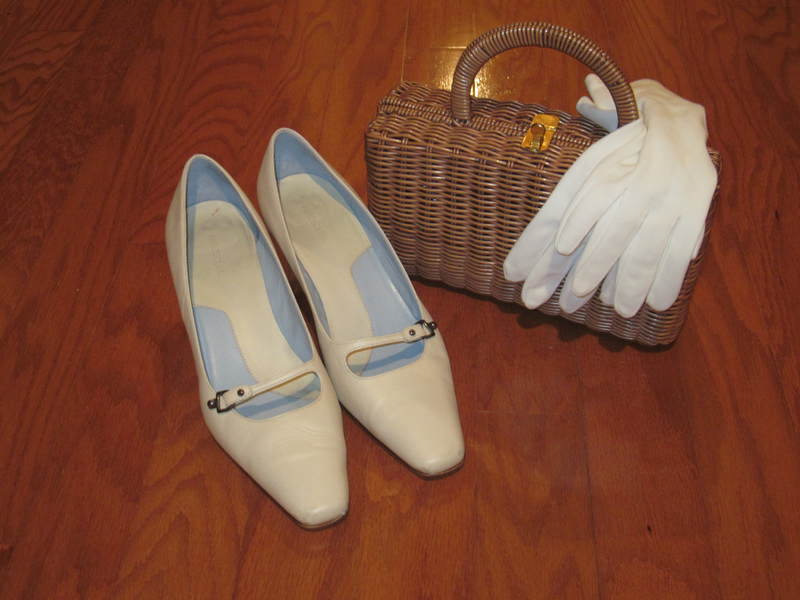 I had the shoes and gloves, but the purse is a $7 acquisition specifically for the occasion. All I need to do is tease my hair a bit, and the outfit skews early 1960s, but I’ll go more 1940s when I wear it on a regular day. There were tons of lessons learned on this project, but I’ll save that for another post. Also coming soon, the mood board for the next top, which is a wearable muslin. 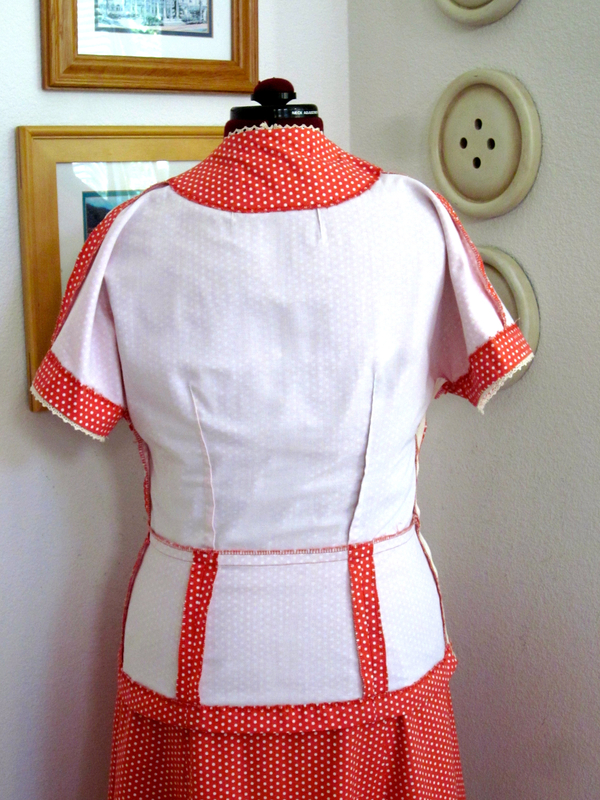 After all this, it’s time for some quick sewing gratification! It looks phenomenal. I can’t believe no serger was involved. Well done! Hope you post photos of you wearing it in action. Yes, I’m planning to take pictures of myself in it. Halloween at the latest. Thanks for asking! Lovely. don’t you just love the feel, the drape and the fit of an underlined garment? Sounds like a fun Halloween for you. Mostly I love the look of the inside, but it feels so much more quality than a flimsy top without underlining. I’ll definitely use the technique again where I think it adds value. I’m guessing it extends wear like lining does. But the next project is a quick one! Great job! Awesome. You took your time and can now beam with the remarkable outcome. Your workmanship is superb. The underlining work is well done. Be bround of what you’ve accomplished. Your Halloween outfit is a smashing success. Love the accessories. If you can, take a pic of yourself and workpeers. Thank you so much! I’m hoping to get pictures of everyone and post them. We have two male coworkers who are planning to shave their goatees and do side parts.’Vintage dresses and purses have been swapping hands. Should be fun. I’ll share all I can.